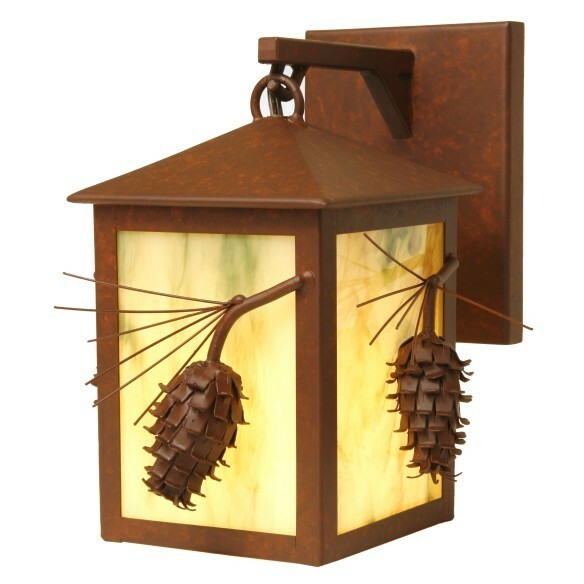 3-D Pine cones are the featured attraction on our Ponderosa Pine Small Hanging Sconce. This rustic pine cone hanging sconce is shown in a rust finish with a bungalow green lens. 3-D Pine cones are the featured attraction on our Ponderosa Pine Small Hanging Sconce. This rustic pine cone hanging sconce is shown in a rust finish with a bungalow green lens. It measures 11"H x 6"W x 8.5"depth and uses one 100 watt bulb. Made in the USA, ships in 3-4 weeks.